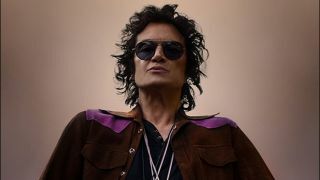 Glenn Hughes is premiering the video for his new single Heavy exclusively with TeamRock. The track is taken from Hughes’ upcoming solo album Resonate, which is released on November 4 via Frontiers Music Srl. Heavy features Red Hot Chili Peppers man Chad Smith on drums and he also appears in the promo, which can be viewed below. Hughes is joined on Resonate by his live bandmates, guitarist Soren Andersen, drummer Pontus Engborg and keyboard player Lachy Doley. Smith drums on two tracks. Hughes previously said of Resonate: “This is my first solo album in almost eight years as I’ve been busy doing other projects. This album is definitely rock – acoustic guitar, electric guitar, bass guitar, drums – all organic vintage instruments – the most grounded rock album I’ve made to date. Smith, who has been friends with Hughes for years, added: “We know each other so well and it’s always fun because playing with Glenn, like any real artist, is always trying to grow and change and do new things. Hughes and guitarist Joe Bonamassa recently began work on what will be the fourth album Black Country Communion album.